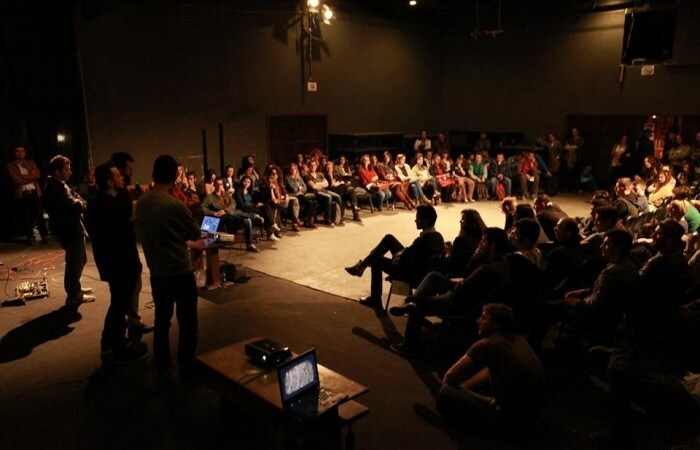 Music predominated the 22nd edition of BarCamp Prishtina. Founders of music bands, who are tech professionals during the day and musicians during the night, were the guest speakers for this edition. Teatri Oda once again was the meeting point for over 100 BarCampers who except of having the opportunity to listen inspiring stories, the also had the chance to see bands performing music on the stage. With over 100 participants in the audience, the Pinkmetal band came to the stage to share their fair share of experiences through the teammates stories. Petrit, a web developer, Granit, a motion graphic designer and Fat, a database architect shared their experience in combining music with technology. They were the typical sample to show how music affects the career of a tech person who is able to express himself freely when taking the drums or guitar after the daily work activities. On skateboards and under the spotlight, Me T’njofshem took the stage to talk about their experience as musicians and tech professionals. “We believe that music should be able to be emitted to everyone and everyone should be part of it”, said Lis Balaj, one of the team members. Except of sharing their interesting stories, they also gave an attractive performance which sparked the audience. Ilir Bajri was the last speaker on stage. He shared a fair share of his personal experience throughout the years, starting from the 90s with involvement in jazz and production. Ilir continued his story by telling the first computer experiences and programming on BASIC language, and followed with the personal experiences around Prishtina Jazz Festival, the coolness of being a musician and upgrading the personal career of a person through cultural activities.